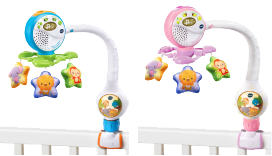 In collaboration with the Consumer Product Safety Commission, we are voluntarily recalling the Lights & Lullabies Travel Mobile™ due to 6 reported cases that the crib attachment clamp can break causing the mobile to fall, posing an injury hazard to an infant in the crib. No injuries have been reported. We are asking consumers to stop using the recalled product and contact our Consumer Services department to return it to us for a refund. Consumer Services is available at 1-800-521-2010, Monday-Friday, 8:00am to 7:00pm CST. You can also contact us by filling out our Support Form. Why is VTech voluntarily recalling this product? There have been reported cases that the crib attachment clamp can break causing the mobile to fall, posing an injury hazard to an infant in the crib. No injuries have been reported. Where can I get more information about this product recall? I have this product, what should I do? We ask you to stop using the product and return it to us for a refund. Consumer Services can be reached at 1-800-521-2010, Monday-Friday, 8:00am to 7:00pm CST. You can also contact us by filling out our Support Form. Has there been any complaints or reports of injury? We have received 6 consumer complaints that the crib attachment clamp can break causing the mobile to fall, posing an injury hazard to an infant in the crib. No injuries have been reported. Is the product not compliant with safety standards? Our products are of the highest quality and tested to meet all applicable national and international safety standards. The Lights & Lullabies Travel Mobile™ is designed and manufactured to satisfy all safety regulations, including SOR2011/ 17, ASTM F963-16 and EN71-1. The reports from a thirdparty testing laboratory also showed our product had passed all safety tests as required. Have the products been removed from the retailers’ shelves? We instructed all our retailers on November 30, 2017 to remove all affected products from the shelves. When was the main sales period for these products? When will the recall end? There is no end date for this recall. However, we encourage consumers to take action on the affected product as soon as possible. Can you guarantee other VTech products are safe for children? Yes, our products are of the highest quality and tested to meet all applicable national and international safety standards. We sincerely regret and apologize for the inconvenience. Creating and developing toys for children is a responsibility we take very seriously. It is important for you to know that we stand behind our products and offer products that are safe for the families who enjoy them.